SIMON, the classic electronic memory game and one of the bestselling games of the 1980's, is back with a sleeker look and enhanced features. THINK FAST! Simon says repeat my flashing LIGHTS and SOUNDS. 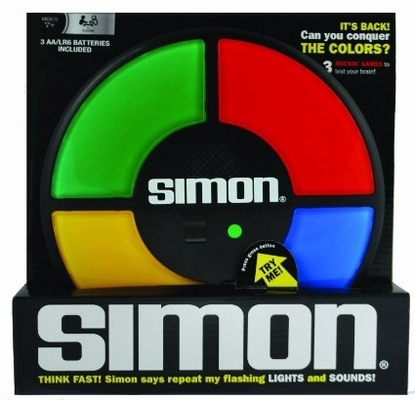 Simon challenges one or more players to memorize the hypnotic lights and sound sequences. 3 ways to play, with both 1 and 2 player modes. New digital screen with Counter and Effects.